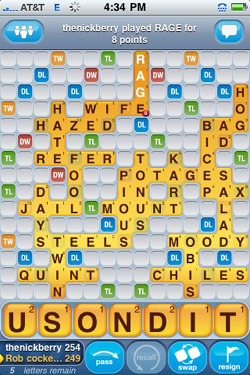 There are about 96 valid two-letter words in Words with Friends. Using them wisely and frequently is often the key to victory, so I recommend memorizing them. I hope this short story will help. The decoder and word definitions follow. Em, my Scottish ex was very loving. She said I was her jo, the ae she was going to marry. We grew apart when she began searching her qi, studying world religions et baking. She was learning about ba and ka from Egypt, Ki and Akkadian from Sumeria, blood and os from Haiti. Myself, I’d rather visit wikipedia and read about Leonard da Vinci, or visit the zoo with an ipod, watching ai climb bo while I listened to Ryan Seacrest struggle to pronounce band names (“ar ef el em ay oh”) Ha! But I thought we were getting along well enough. I loved when Em would meditate while baking, chanting “om” while a za or pi was in the oven. Mm! She ended it abruptly. “I am leaving”. Saddened by the end of us, I examined my shortcomings. Did I need drivers ed? er, ab work? “Oi!”, he held up a finger. “Sh!” He was staring at the ad, probably figuring the cost of al shrubs in xu. Trying to become better at Words with Friends? Memorize this list of legal two-letter words! 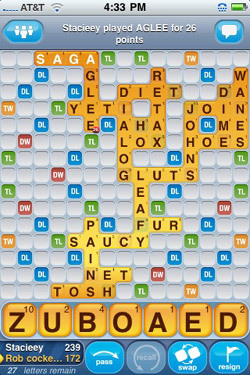 When you destroy your Words with Friends opponents with an array of odd two-letter words, the post-victory confrontation will go smoother if you can back up your victory with an adequate knowledge of what all those damn two-letter words actually mean. Behold! aa - Basaltic lava having a rough, jagged surface, what you fall into if you miss your AA meeting. ab - Shortened form of abdominal muscle or injection-induced abscess. ad - short form of "advertisement"
ag - short form of "agriculture"
ah - an expression of surprise or delight. an - a form of the word "a", used in front of words which start with a vowel. ar - variation of "are" or the way to spell the name of the letter "R". as - to the same degree, or for instance, or thought to be, or in the manner. at - in, on or near. used to indicate a point or place. ax - tool with a bladed head, for chopping wood. ba - an aspect of the soul, from Egyptian religion. Represented as a human-headed bird. da - from or of, used in Portuguse and Italian names, like John da Vinci. de - from or of, used in Spanish and French names, like John de Toledo. do - perform or execute. ef - way to spell the name of the letter "F". el - the elevated railway, also, the way to spell the name of the letter "L"
em - a measurement of type size, a way to spell the name of the letter "M"
en - also a measurement of type size, a way to spell the name of the letter "N"
es - the way to spell the name of the letter "S"
et - an obsolete form of "and". ex - short form of ex-girlfriend, the way to spell the name of the letter "X". id - In Freudian theory, the division of the psyche that is totally unconscious and serves as the source of instinctual impulses and demands for immediate satisfaction of primitive needs. Might be short for "instinctual drive". is - Third person singular present indicative of be. li - a Chinese unit of linear measure, equal to about one third of a mile (500 meters). ma - mother. See also yo yo. me - I'm Rob. A pisces. od - a hypothetical force formerly held to be present in all of nature and to manifest itself in magnetism, chemistry. oi - interjection used to express dismay or annoyance. oy - interjection used to express dismay or annoyance. re - the syllable used for the second tone of a diatonic scale. we - the plural version of I.
ye - short for you. British.